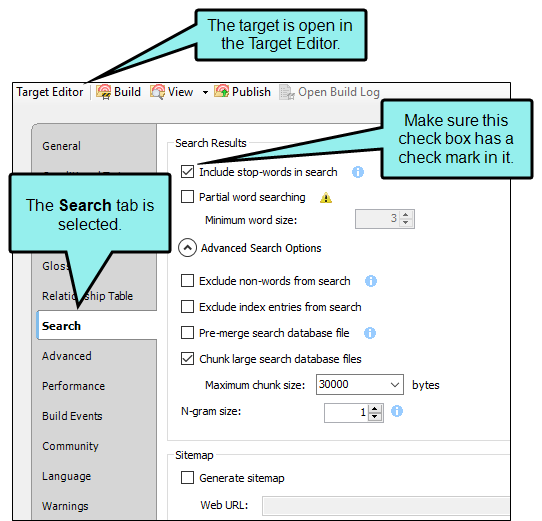 Following are issues that may occur when using the search feature in Flare. If you are generating a WebHelp target, there may be stop-words in the stop-words list that are preventing the search term from being found. This list can be changed in the target. In the Project Organizer, open the Targets folder. Double-click the necessary target. The Target Editor opens. 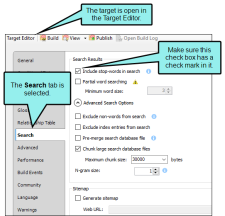 In the Target Editor, select the Search tab. Click the Include stop-words in search check box so that there is a check mark in it. For more information, see Including Stop Words in Search. A common issue encountered by Microsoft HTML Help developers is when a "No Topics Found" message appears while searching a CHM file. Typically, this is the result of an unregistered dynamic link library (DLL) file on the computer building the Help file. The DLL is named "itcc.dll" and is a component of Microsoft's CHM specification. Its purpose is to supply the operating system running Flare with the ability to build a CHM file with index and search capabilities. A variety of software vendors (particularly those that develop Help authoring tools) distribute a copy of the itcc.dll file along with their program installation files. Should you happen to install or uninstall program with a copy of this file (e.g., a Help tool or software program from another vendor or another MadCap software tool that requires this file), it is possible for other copies of the itcc.dll file to become unregistered. You will need to manually register the DLL using a batch file or the command line utility. After registering the DLL, build your Microsoft HTML Help output again. Then retry your search in the output. Note: The path that you use depends on your specific system configuration. For users running the 64-bit version of Windows, you will see two folders named Program Files on your C: drive. Typically, the folder named "\Program Files (x86)" stores non-native 32-bit applications, and the "\Program Files" folder stores native 64-bit applications, such as Flare. If you installed Flare in a different location, you need to determine the appropriate path to the \bin directory. 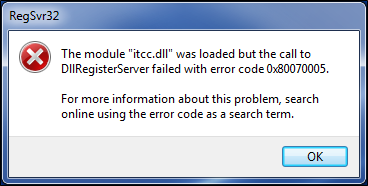 In the bin directory, double-click the file named RegisterItcc.bat. This runs the batch file. If the registration is successful, a message appears telling you so. Note: If the following error message appears, the account you are using may not have sufficient permissions to run the batch file on the computer. You will need to use your computer's command line utility to register the DLL as described below or contact your Windows administrator for assistance with registering the DLL. In Windows Explorer, open the computer's System32 directory. The path is C:\Windows\System32. 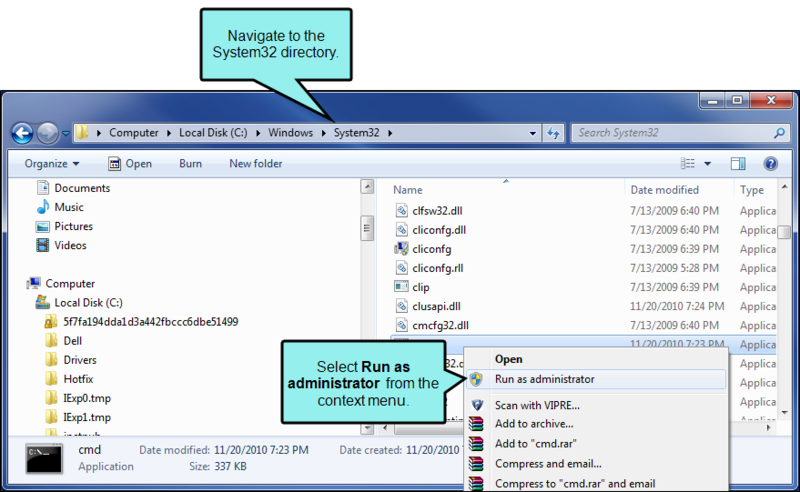 Right-click the application file named cmd.exe and select Run as administrator from the context menu. If the User Account Control message appears, click Yes. This allows you to use the command prompt to make changes on the system. Note: In Windows 7, you can use this method to run the command prompt as an administrator when you are using an account that does not have administrative credentials. This typically allows most users to make changes to the itcc.dll file in the Flare \bin directory. Use this information to enter the following path, depending on the version of Flare you are using. At the command prompt, type: registeritcc.bat. Then press Enter. This runs the batch file. If the registration is successful, a message tells you so. Click OK to acknowledge the message. If you test the micro content in your output and notice that searching on one phrase is opening the results for a different phrase, you might want to see if you have a synonym set up that is causing the issue. For example, you might have previously added "iPhone" as a synonym for "telephone." Then in a micro content file, you add "iPhone" and "telephone" as separate phrases. When users search for iPhone in the output, they will see the results for telephone instead. If this occurs for you, you might want to see if you have a conflicting entry like this in your synonym file, then remove it. If this does not solve your issue, please contact Technical Support. Locate and double-click your synonym file. The Synonyms Editor opens to the right. For more information, see Synonyms and About Micro Content.